comScore has just released its latest numbers regarding the mobile landscape here in the U.S., finding that Samsung is still the top OEM with a 25.6 percent marketshare, up just .3 percentage points from the three month period ending in August. Meanwhile, Apple’s price drop on the iPhone 4 along with the introduction of the iPhone 4S has taken its share of the market from 9.8 percent to 11.2 percent. Mind you, this report doesn’t include holiday sales numbers (Galaxy Nexus, included), and as we know thanks to Flurry data, 6.8 million iOS and Android devices were activated on Christmas day. It’s unclear how exactly those activations were split among the two platforms, so there’s no telling if it actually made a difference in market share, but it’s worth considering. 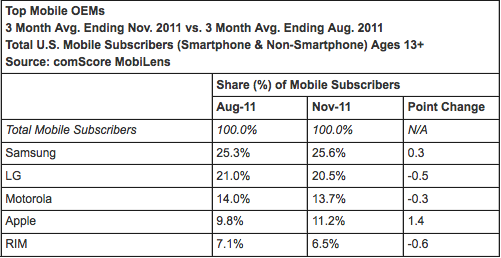 These numbers also include feature phones as well as smartphones. LG (number 2) and Motorola (number 3) both slipped a bit during this time frame, along with last place RIM (which is to be expected, seeing that RIM is doing silly things like getting $1.7 million in PlayBooks stolen at a truck stop). As far as the mobile OS is concerned, Google still reigns supreme with a 47 percent market share, up from 43.8 percent last period. Apple comes in second, taking its share from 27.3 percent to 28.7 percent, while RIM, Microsoft, and Nokia all slipped this period. 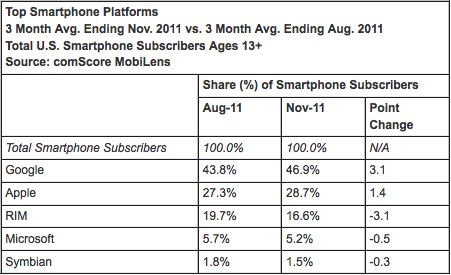 Most notably, RIM lost 3.1 percentage points in platform market share, dropping from 19.7 percent in August to 16.6 percent.